News — The Art of Glenn Barr! first-ever enamel pin release from artist Glenn Barr at PinzuCon on Saturday, July 21st, at The Rust Belt Market in Ferndale. Glenn will be on-hand from 11am-1pm. Get some flair! 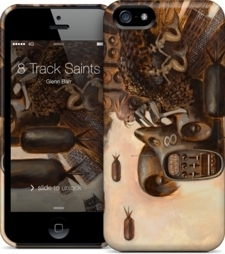 MARTIAN TOYS third installment in their exclusive artist series Prints On Wood comes Glenn Barr’s “The Long Night”. A beautiful 9" x 9" print on bright white 3/4 inch sustainable birch wood by PrintsOnWood.com. Release was Sunday at 3PM EDT on MartianToys.com. Comes with a signed and numbered 5×7″ print by Glenn and hand screened printed muslin bag. GREAT WRITE UP FROM HI FRUCTOSE !! Glenn Barr, devNgosha, and William Wray are three artists who share an affinity for 1960s cult film characters and subculture. Tomorrow, they join together at Merry Karnowsky in an exhibition of new works that elaborates on their inspirations. We first featured Glenn Barr’s nostalgic portraits in HF Vol. 10, which range in emotional appeal and design. His background in graphic novels has progressed into a unique style that combines cheesy glamour with scenes based in modern reality. 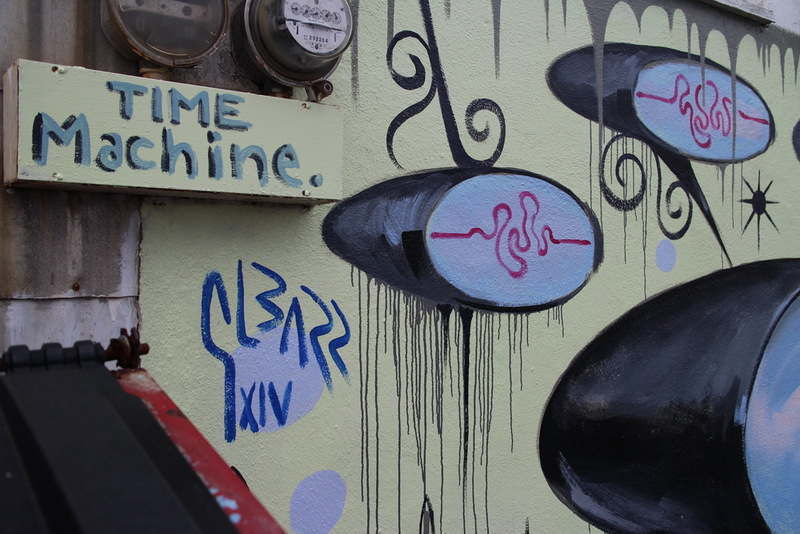 With the concept of “communication” as a central theme for these new pieces, we find them talking on rotary telephones. His compositions are more intimate than previous works, cropping into the face of his subject to focus on her expressions. William Wray’s works are intimate in another respect, as he portrays well known superheroes like Batman and Spider-Man in their private life. Rather than the glorified portrayal we are used to, Wray shows them having a smoke on the street or waiting for their laundry to dry. The most playful and abstract representations are by devNgosha (Devon Liston and Gosha Levochkin). Their latest paintings are vibrant, visually layered portraits, such as oldschool cowboys and a Transformer on a dry Los Angeles-backdrop. One piece pays homage to Belgian artist René Magritte, whose paintings continue to inspire the entertainment world. Surreal, ironic and emotional, the three artists offer a remixed version of Hollywood that is more genuine than it is kitsch. 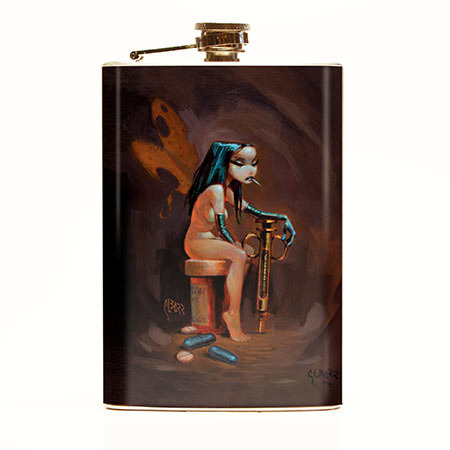 NICE PROPS FROM JUXTAPOZ !!! In his debut exhibition with KP Projects/MKG Glenn Barr’s narrative backdrops feature women embroiled in the subtle complexities of everyday life. Inspired by cult films of the 1960s and 70s, the hauntingly beautiful figures in Glitterland exude the sensuality and tension found in pulp art or film noir - an uncertain reality that extends beyond the frame. The exhibition is not only a visual paradox of the cheap glitter of Hollywood glamour, but a glimpse into the private spaces of communication embodied by anonymous heroines whispering into telephones of a by-gone era. Barr began his artistic career after graduating from Detroit'’s College for Creative Studies. For the past two decades he has contributed to numerous graphic novels, animated cartoons, and rock poster art. He has exhibited extensively both in the U.S. and abroad. Hello everyone, welcome to the new site. There are many things on the horizon for 2014 & 2015. So right here we'll be keeping you informed on all the latest up coming exhibitions and projects. There will be a new print releases every month or so .... and we'll let you know thru this site and on FB when they're due to drop. To launch the new site we're offering 3 NEW prints! The one print titled "10pm" offered in our store is from the 2013 group exhibition Risque' at the Long Beach Museum. We're offering 2 sizes on this. The other print titled "Waiting Again" is produced at almost actual size. It is a small and intimate piece that was in my Brooklyn show at the Cotton Candy Machine. The quality is very high on these limited edition pigment prints. We're quite proud of them. NEW from NUVANGO for iPhone, iPad, and More! Over this past week hundreds of contemporary artists from all over the world gathered in the Kaka’ako neighbourhood of Honolulu for the POW! WOW! Hawaii 2014 mural festival. Engaging with the local community in the creation of art, the show works to reinvigorate the city with a range of gorgeous artwork. 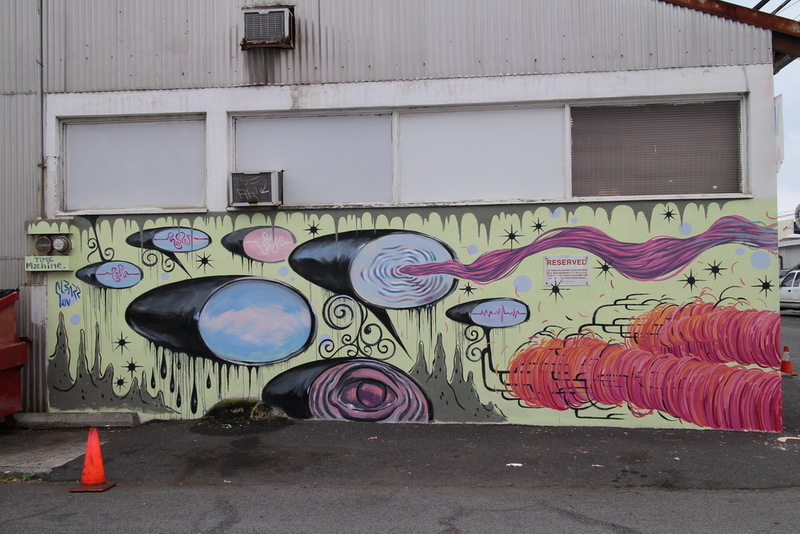 After collecting paint from Lana Lane Studios and Home Depot on Monday, the artists got to work on their walls, progressively developing their pieces over the course of the past five days. 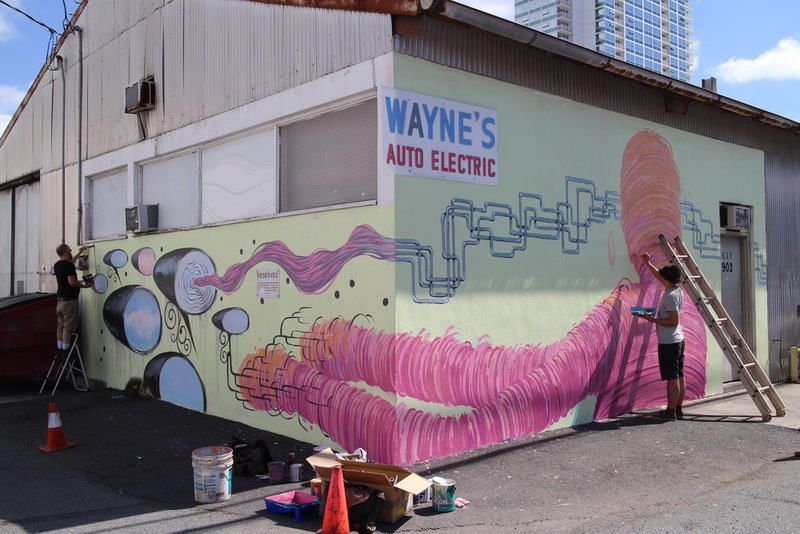 Working under the hot Hawaiian sun, artwork of all sizes and styles are coming to life across Kaka’ako. Throughout the week we walked the circuit daily, capturing all the work in progress. Although pieces by some great artists like Kinsey, Vhils, Know Hope and Cyrcle are not yet ready to be shown, we can already share a selection of some of our favorites we’ve seen so far this week. Seen in the gallery above are individual and collaborative works from: Meggs and Bask; Lady Aiko; Gage Hamilton; Roids and INSA; Seth; Inti; James Jean; Skinner, Aaron Glasser and Spencer Keeton Cunningham; Dabs Myla and Misery; Gaia, Prime and Solomon Enos; Reach; Axis; Katey and Jessie; Madsteez; Augustine Kofie; Tristan Eaton; Scien and Klor of 123Klan; Apex; ASKEW; Ron English; Brendan Munroe and Glenn Barr; Defer, Norm and Kamea Hadar; Reka; Andrew Schoultz and Hannah Stouffer; Cope2 and Indie184; and Buff Monster and Nychos. Check out the official POW! WOW! website for more. 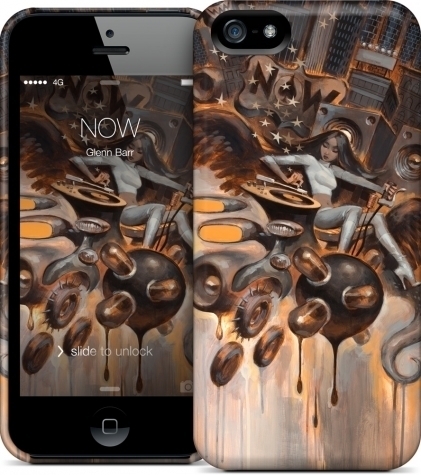 Now available at Retro-a-go-go, DetroitLand is a collection from the inspired vision of Glenn Barr. 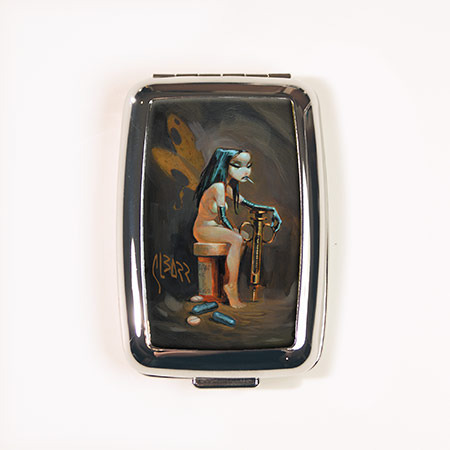 Hand picked by the artist, his work is now handsomely reproduced on finely made portable metal cases, heavy gauge tin signs and chrome plated pill boxes. Gracing the travel friendly boxes are images of surreal creatures, specters and iconic characters mixed with an urban aesthetic echoing the palette and texture of a postindustrial city. 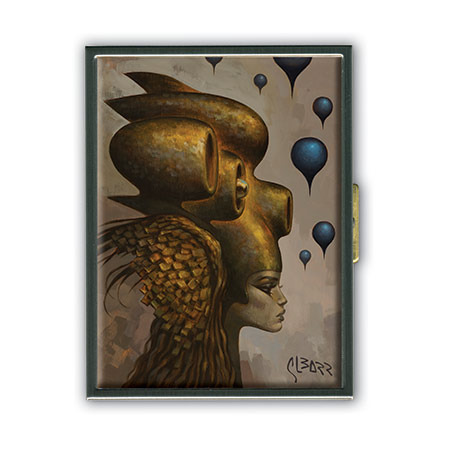 These Detroit dreamscapes rest on beautifully designed metallic boxes that can fit discreetly in your pocket or handbag. The DetroitLand Collection enables you to take a little “Haunted Paradise” with you wherever you go. Made in the US of A. An image of a face can tell quite a story, especially when painted on a found object. Together they create a unique portrayal because the scarred wood has a personality all its own and the subtleties of the human expressions are endless. In "Faces", Detroit artist Glen Barr focuses on the face, the striking face, the iconic and the ideal face as his narrative. "I feel the paintings for this show need something other than canvas to rest on, so I've used found lumber, scavenged from the Detroit landscape, much as I used to do when I started out in the art world. I've always liked painting on found objects that have history and personality, like tired, sun-bleached panels from some collapsed building, or discarded cabinet doors lying alongside the road. By discovering them and painting on them, I'm infusing these wood remnants with new life, which gives my work a natural aesthetic of familiarity and creates a permanent visual of the iconic ideal. There is some new ground I am going to cover too which I rarely do. I will have a few "likenesses" in the exhibition and I had a great time painting them"states Barr. At the beginning of his career and throughout the 1980s and 1990s, Barr contributed to graphic novels, animated cartoons, rock poster art and a variety of other ephemera. Recognition for his paintings came with solo exhibitions in the late 1990s Since then, he has exhibited internationally and published compilations of his work in "Lowlife Paradise" (2003), "Haunted Paradise" (2006) and his new volume, "Faces." Detroit-based artist Glenn Barr presents a 96-page compilation featuring details from 80 paintings and drawings he created over the past five years. Inspired by the complex expressions and raw emotions revealed by faces, Barr invokes the human condition, creating a multitude of personalities ranging from extraordinarily common to extreme and fantastic. Barr uses pencil and brush to render elegant and elongated necklines, exaggerated eyes, and the gentle or jagged slopes shaping the noses or foreheads of the men, women, and monsters he creates, whether they are beautiful, ordinary, or even grotesque. Expressed in the intricate details of each image, Barr presents a delicate mix of texture, color and line typical of the his loose but carefully executed style. Turn the page to reveal subtle or manic emotions of the wise, the wicked and the wistful. "Faces" brings each reader one step closer to experiencing first hand the compelling mind and interesting characters found in the world of Glenn Barr. "Distortion and contortion of the FACE gives me the freedom to tell a better story and to create a better composition. Elongating the neck and exaggerating the eyes, the forehead either grossly enlarged or minutely petite, the odd slope of the nose, even the oversized and perhaps misplaced mouth, can reveal the subtlest emotions. Even the hair framing the FACE can stream decorously, capable of communicating a life all its own, one grounded perhaps in vague tragedy or masked rapture. I also love the play of light and shadow, assisting and enhancing the narrative, creating mood and energy within the frame, expressing the emotion. In essence, it's all about dynamics." La Luz de Jesus is located at the Soap Plant/Wacko building, in Los Feliz at 4633 Hollywood Blvd, Los Angeles, CA 90027. Gallery hours are Monday - Wednesday: 11am - 7pm, Thursday - Saturday: 11am - 9pm and Sunday 12-6pm. It's got a good beat and you can paint to it. Forgive the pun, paraphrase, or whatever else you deign to call that opening sentence. We're not making light of Lyric, a forthcoming show at 323East that will be curated by Glenn Barr and will feature two-dozen or so works by an impressive list of artists. We're just happy to see that, in an art world filled with far too many ambiguously-themed exhibits, there are still group shows that don't require a refresher course in either Barthes or Baudrillard. And that is the starting point for every piece in this exhibit. Barr asked each participant to "transcribe" a musical motif and its words onto canvas. The result is an impressive score and one without a single discordant note. Music and its lyrics can always stimulate our emotions and it can have us contemplating a visional narrative. Lyrics have been known to be the fodder of some of the greatest works in the world. This exhibition will illustrate the artists personal transcription from a songs lyric to canvas. TWIN PEAKS 20TH Anniversary Show Opens Tonight! Tonight opens the Twin Peaks 20th Anniversary show at Clifton's Brookdale in Downtown LA. Go check it out!